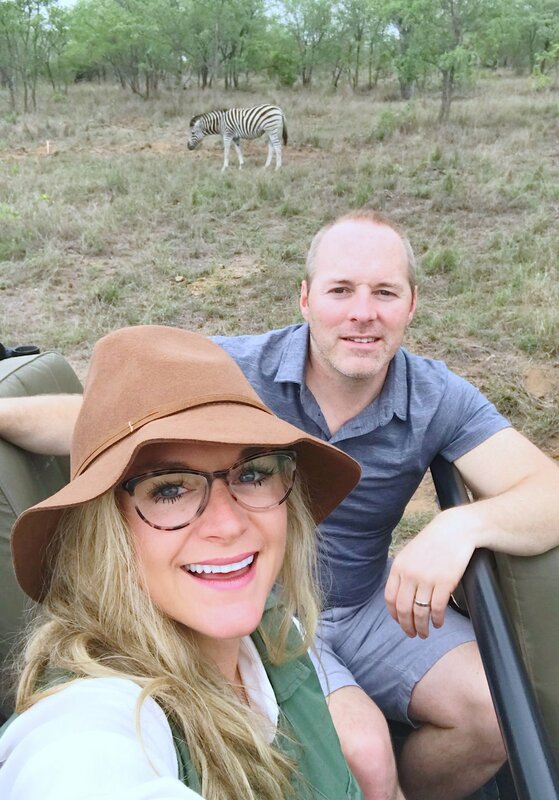 Pictures and videos are worth a thousand words, and if you follow me on any social media, you saw exactly that when we were on safari in South Africa. If you can imagine though - as absolutely amazing as every picture and video was that I took - they just don’t do justice what we saw. I’m not quite the crier, and I cried when we left. I have thought about safari every day since we arrived home - literally every day. I have gone through my pictures and looked at my videos more times than I can count (side note: I never look at pics again after I take them unless it’s for a blog or social media post... I seriously don’t know why I take so many). And finally, and maybe most important to mention, I’ve had actual dreams on the regular about this trip since we returned home. All the cool places Tres and I have been lucky to go to, and I have never come home and dreamt about them. Lions, Zebras, Hyenas - they’re dancing around in my head as I slumber. If that doesn’t sum up an unforgettable experience, I don’t know what does. So let’s talk about it. I will start with a fun story about how bad I have wanted to go on this trip - you may skip to the FAQs if this is not of interest to you, I won’t blame you if you do. But here goes... My entire life I have been obsessed with animals (babies as I call them). I wanted to be a veterinarian growing up but me and science never got along very well in school so I got over that dream. When I met Tres and we talked about where all we hoped to travel in life, all he heard from me was, “If I ever get to go on an African Safari, I don’t ever have to go anywhere else the rest of my life.” So one lovely year in May - 2011 to be exact, and the year after our wedding - we decided to go to the Kentucky Derby. Anyone remember this Derby? It was a good one - a year of the underdog. Well, we were there and before the big race, we placed our bets. Of course, I knew nothing about any of the horses and before I went to place my bet, I didn’t even know any of the horses names. But then I saw “Animal Kingdom” and couldn’t place my bet fast enough. Tres and everyone standing around me laughed when I told them I was betting on this horse. I’ll never forget how many people told me this horse had a negative zero chance of winning. So I said to Tres, “If Animal Kingdom wins, you have to take me on an African Safari.” I’m not a big gambler so I bet a whole $20. Guess what that $20 became? About $1,000. Because my African Safari dream horse won the race! So years pass, we plan lots and lots of trips but the safari didn’t happen until 2018. It took 7 years and we finally went on my dream vacation. As you can see, I had high expectations. No question, it lived up to all of them. 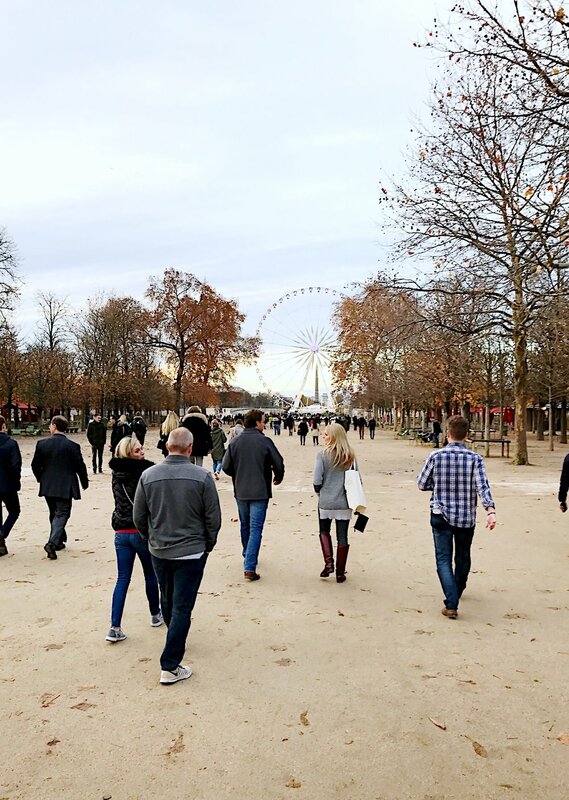 First are a few highlights from the trip that I absolutely loved then you can read the FAQs below to really dig into what the experience is all about - especially if you’re planning one of your own! The ease of planning thanks to the travel company we used - Rhino Africa. Our friends who have been on safari a couple of times recommended these guys and they were dream planners. We even waited until the last minute (a month out) and Rhino Africa got us right on track. We didn’t have to think about a thing, we just showed up in South Africa and it was all done. The surprisingly quick (17 hour) flight over. We have been on a lot of long international flights but this one... I worked myself up about this one. Seriously, what do you do on a plane for that long? The Delta flight we took from Atlanta to Jo’burg is the 2nd longest flight in the world. But it was actually the easiest international flight we have ever taken. Movies, eat, sleep, sleep some more, and you’re there! I’m always cranky when we go to Europe because I never get enough sleep. There’s PLENTY of time to sleep on a 17 hour flight. When I woke up and Tres said, “we land in 30 minutes,” I thought he was lying so bad I had to look at my flight duration screen. I was refreshed and fabulous when we arrived! The most amazing lodge - Savanna Private Game Reserve. 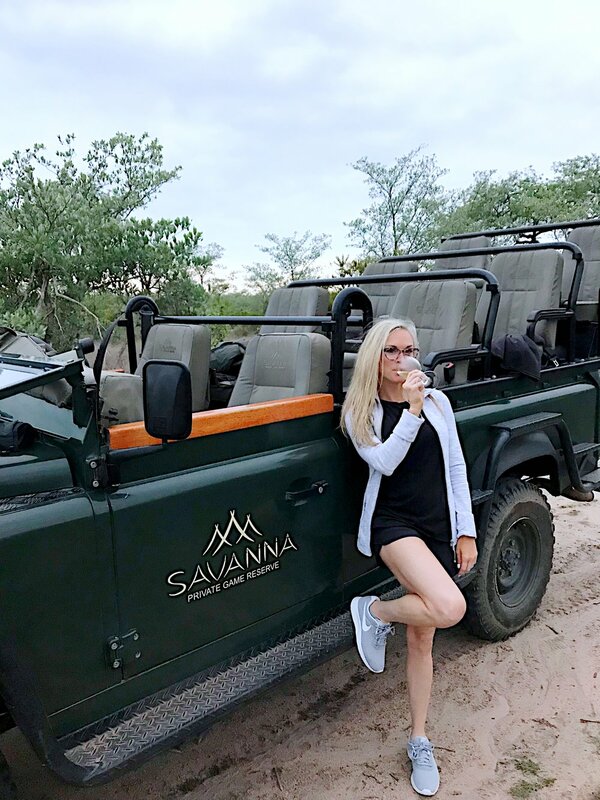 I cannot recommend Savanna Lodge enough. 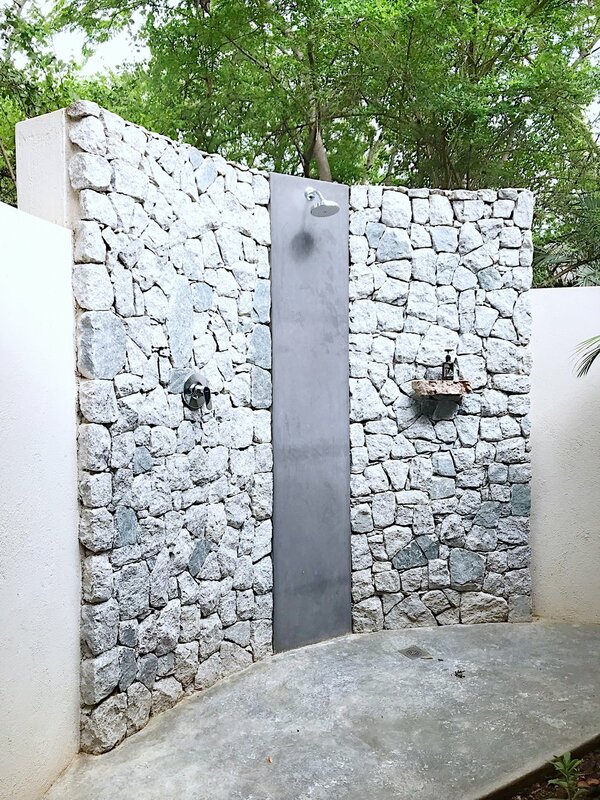 The beauty of it, the relaxation, the serenity, the fancy “tent” rooms with private plunge pool and outdoor shower with animals in view, the food, the service, the game rides, the staff, the daily laundry service, the nightly turndown service - literally everything! More below and in the FAQs on how fabulous this resort is and why I think you should choose it on your own trip. The food experiences. Tres and I are not big “all-inclusivers.” As a matter of fact, on any other trip we don’t do them at all - as I’m sure y’all already know, we would rather restaurant hop. 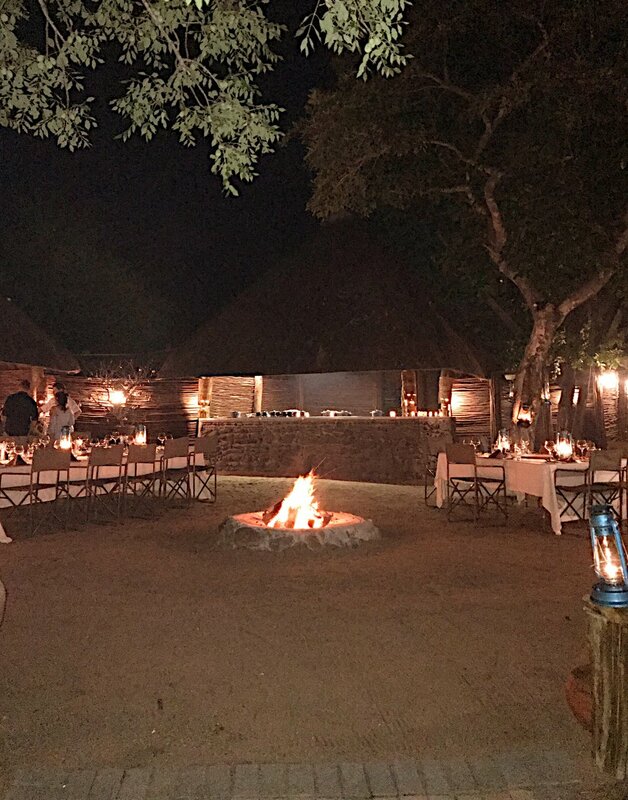 But on safari, you don’t really have a choice (you’re in the middle of the bush with the only food being at the resorts) so you want to make sure you choose a lodge with great food. At Savanna, dinner every night is a surprise. You never know what cool experience you’re going to get, but you can always count on twinkly lights, warm and cozy fires, entertainment, beautifully set tables, delicious wine and champagne that flows throughout the night, and fantastic food - from the small bites at social hour to the set courses at the table. More detail about each night in the FAQs below. Aside from the animals, this was my favorite part. Tip: do the restaurant hopping in Cape Town - it’s a food dream. I’ll have a blog post on Cape Town soon. The game rides. Another part of the “all-inclusive” experience, this is another one you want your lodge to do well. No, actually this is THE ONE THING you want your lodge to do well; after all, you go on safari to see animals so you want the staff to make this an absolute priority. This is Savanna’s priority. 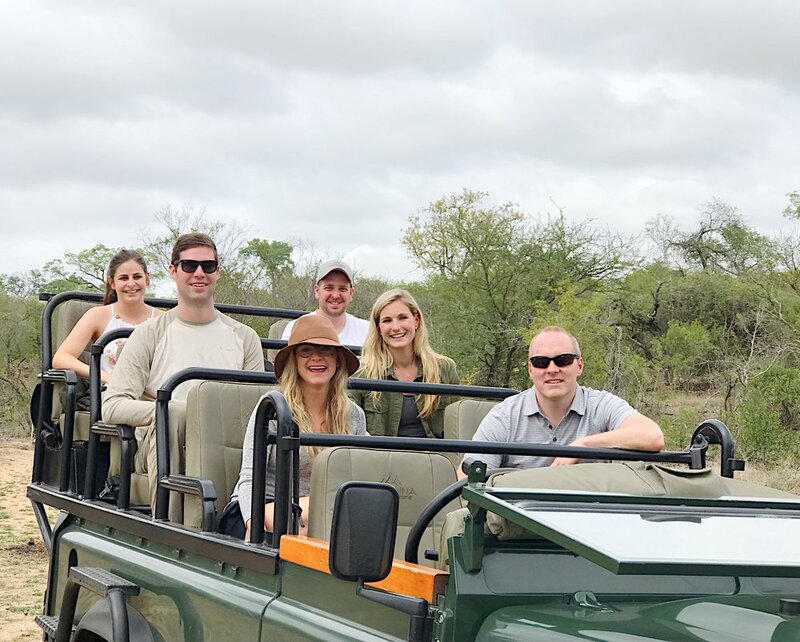 According to our travel planner at Rhino Africa, every lodge does things a little differently, and she could not say enough positives about how much of a focus Savanna makes their games rides, so we knew we were in good hands. We had days when we would even stay out a little later to make sure there wasn’t anything we missed. There was no rushing back for lunch/dinner or any type of strict schedule - it was all about seeing the animals. Tres’ biggest concern going on a safari was always, “what if we go all the way there and we could have seen more at a zoo.” The guys at Savannah make sure you see it all - it’s unbelievably cool how much you see, y’all! I can’t put into words how neat it is seeing these animals in their natural environment. And they’re so close - oh my! There were moments when they were so close I could almost touch them. But please, as excited as you may get - don’t do it! You’ll think about it.. You will. That’s how close they are. Just don’t - yikes! The friends we made. We got incredibly lucky and met some of the coolest people. For 3 days (or however long you stay) you’re doing everything together with your guides and lodge neighbors. Every breakfast, lunch, and dinner you sit down together to eat and have drinks so you get to know the other people there pretty well. We absolutely loved our entire game ride group - all around our age so we had a lot in common. One couple was on their honeymoon from Charleston so we had the south in common with them. 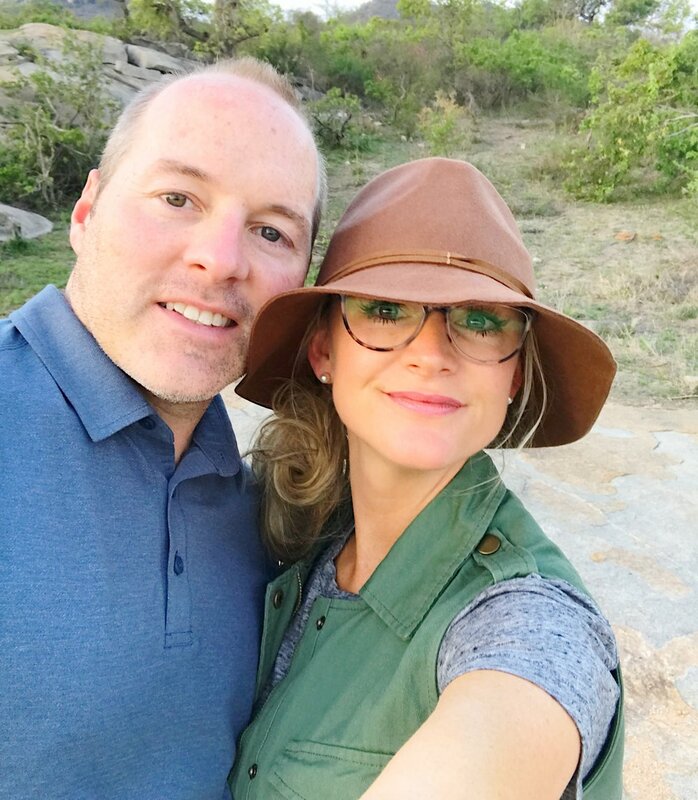 The other couple was from Jo’burg so they gave us a lot of restaurant recs for Cape Town and explained to us some of the traditional South African dishes and foods. And our guide, Kevin was simply the best - full of great knowledge and information about the animals and lots of fun to chat with at dinner. I even met a wonderful fellow “woman in business” entrepreneur from London I have kept in touch with since we left. She’s the CEO of Samaya Ayurvedic an amazing skincare company in London, and we are planning a giveaway collaboration soon, so stay tuned! Sabi Sands is the way to go! At least that’s what we heard from family and friends who had been on safari, so we chose a lodge in the Sabi Sands. As for the lodge - Savanna. It was amazing. Read in my highlights above. Like I said, where you stay pretty much IS the experience you’re going to have on safari so you want a good lodge! We were worried 3 days wasn’t going to be enough time, but it’s plenty. Each day, there are 2 game rides - one in the AM and one in the PM. 3 days = 6 game rides. Would I stay longer? Yes, of course! But we felt like we saw everything we wanted to see in 3 days. Every single ride truly is a completely different experience - you literally never know what’s going to happen. I can see how it could become an addictive hobby if you live in South Africa. The Jo’burg friends we met told us they have been on too many to count - I am so jealous! It’s impossible to know how each ride is going to go - They’re all so unique! We were so lucky that the first ride we took, lions had just taken down a warthog and were feasting. We all but saw the kill - that would have been super cool (or I would have cried)! 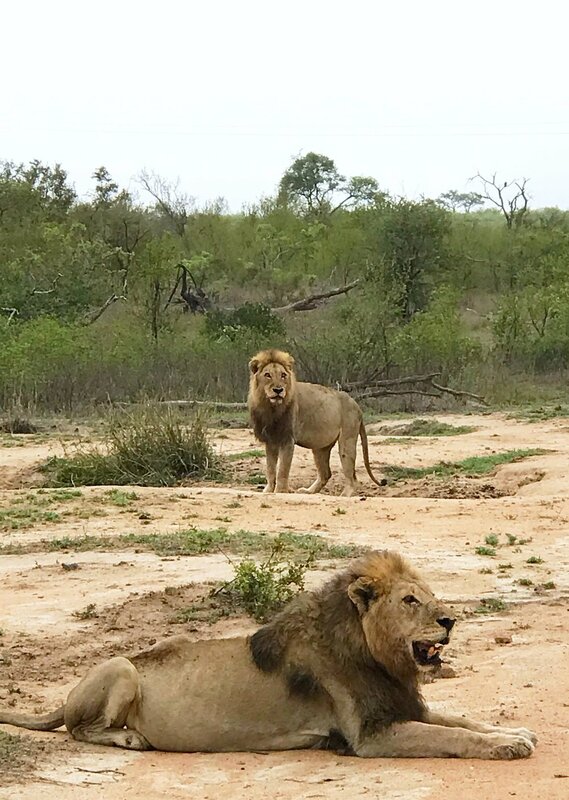 But just imagine, we get to the lodge, get settled in, jump on the open-air Land Rover, and in minutes we are looking at a pride of lions eating away at a warthog. 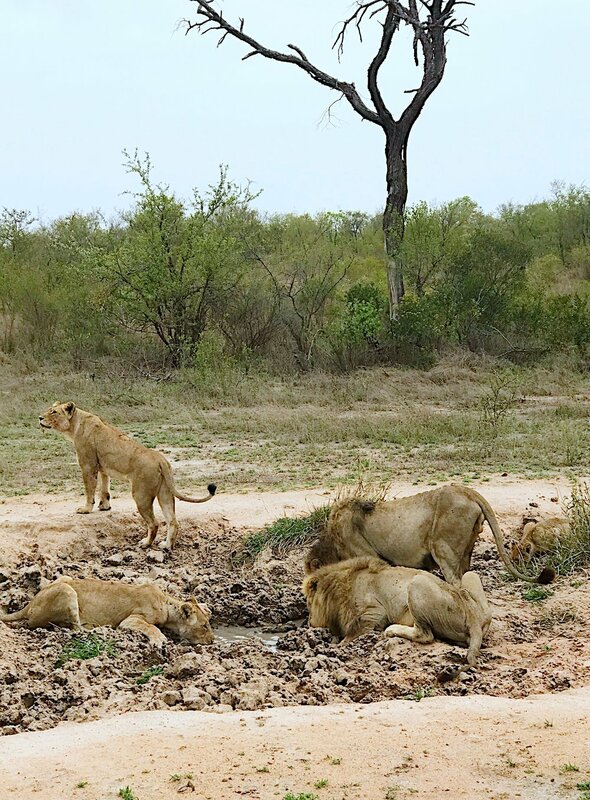 The next day, Kevin informed us they would be thirsty soon after their kill the day before, and sure enough, we found water near the kill, and here came the same pride of lions to drink. It was “baby season,” so saw a lot of babies with their mamas - baby cubs, baby zebras, baby elephants, a baby rhino, a baby giraffe... so extremely adorable! A leopard walked so close to our car his tail rubbed the sides. I had a hyena look me dead in the eyes one day and started walking towards our car and it got SO CLOSE it was scary. I thought he was after us, but they literally care less about you - it’s amazing. Elephants were everywhere!!! I think we saw elephants every day, and how close we got to them to watch them eat was so phenomenal. Their trunks and the way they break down food is so neat. 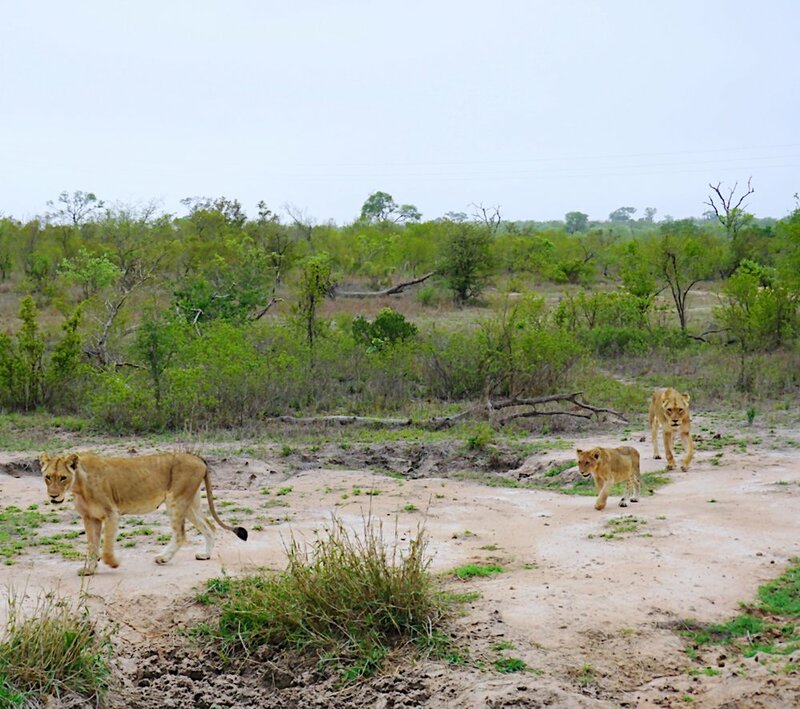 The final day, we tracked down a mama lion who had left her cubs to hunt. She was very protective of the kill she’d made - guarding it from vultures that were doing everything in their power to take scraps. A couple of the vultures got bravely close and she came running out of the grass towards them. That was SO intimidating to see the look in that creature’s eyes when she means business - one of the cooler things I’ve seen in life. A lot of this and more is in my Instagram stories - you can actually watch it @andreas_cooktales. It’s going to depend on where you stay, so I can only speak to Savanna’s food and drink, and it was fabulous. Your room is stocked with snacks, beer, wine, and all kinds of drink choices. When you arrive to the dining area for each meal, you’re immediately greeted by your very own butler. Dan was ours, and we just loved him! The breakfast every morning was so fresh with a huge cold selection. Anything you wanted hot was made to order + there was a new, daily breakfast special each day - everything from specialty French toast and pancakes to an omelet, sandwich, or wrap “of-the-day.” I had scrambled eggs with avocado every single day. They literally had some of the best scrambled eggs I have ever had, so I kept ordering them. The lunches were one of my favorite parts of the trip. I love cold salads and they had a variety each day: quinoa fruit salads, veggie and grains salads, bean salads, olive and tomato salads. They also had specials of the day like pastas, meats, quiches - the works!! We had a glass of wine or two at lunch and an espresso shot before the afternoon ride. Dinner was the most fun, as it was always a surprise. Night 1was lantern and campfire lit with the most beautiful set tables. 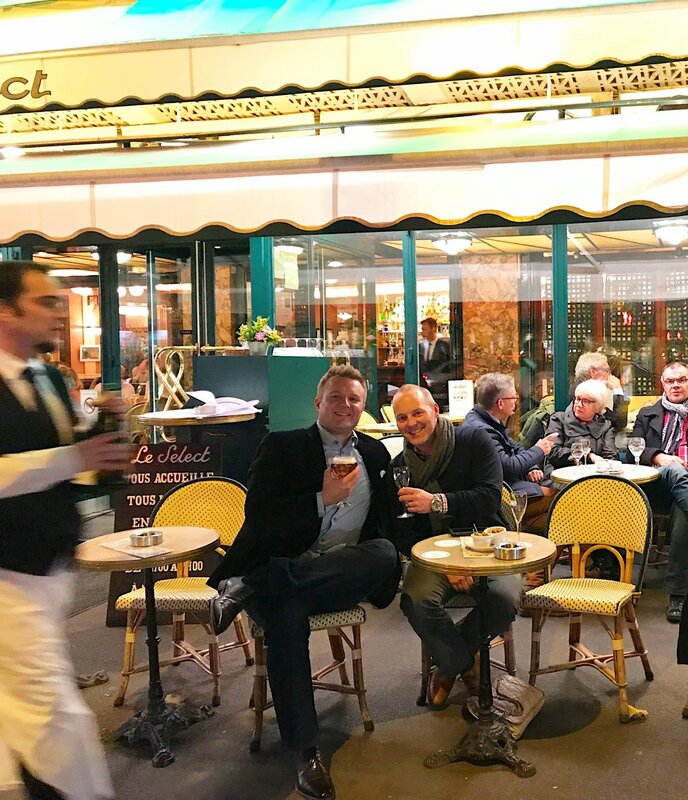 We were immediately approached for drink orders and wild boar sausage and bruschetta were passed around while we walked around chatting with everyone. The seated dinner consisted of salad/soup, delicious outdoor roasted chicken, traditional South African meats, and sides. We were entertained by a local choir group as we ate. 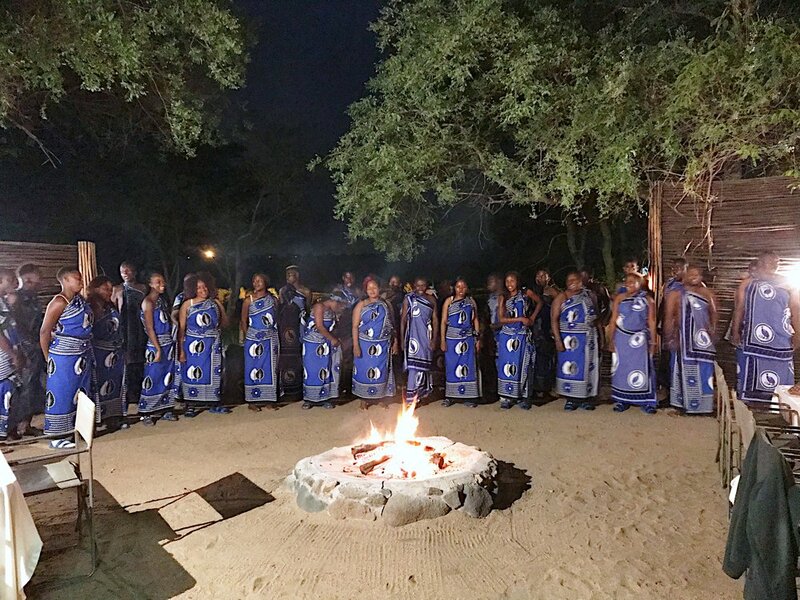 They danced around the campfire and sang traditional African music. My favorite part was when they sang me happy early birthday, clapping, and dancing all around my seat. It was all so traditional and fun - such a warm welcome to South Africa! Night 2 was my absolute favorite. I kept telling Tres, I can’t believe we are here. I love this place so much. We went straight from our game ride to the most beautiful scene right outside our resort: An old train car that had been converted to a dining room. Outside we were welcomed by Dan with champagne and delicious bites. There were candle-lit pathways, lanterns hanging from tree branches, a warm fire. We socialized outside before we went in the train’s dining room for a fantastic 4-course dinner.Night 3 was back at the resort, but in a different dining area than the first night. Every thing twinkled, the wine flowed, and the food was 3 courses of perfection. There was even a masseuse on site - very unique! 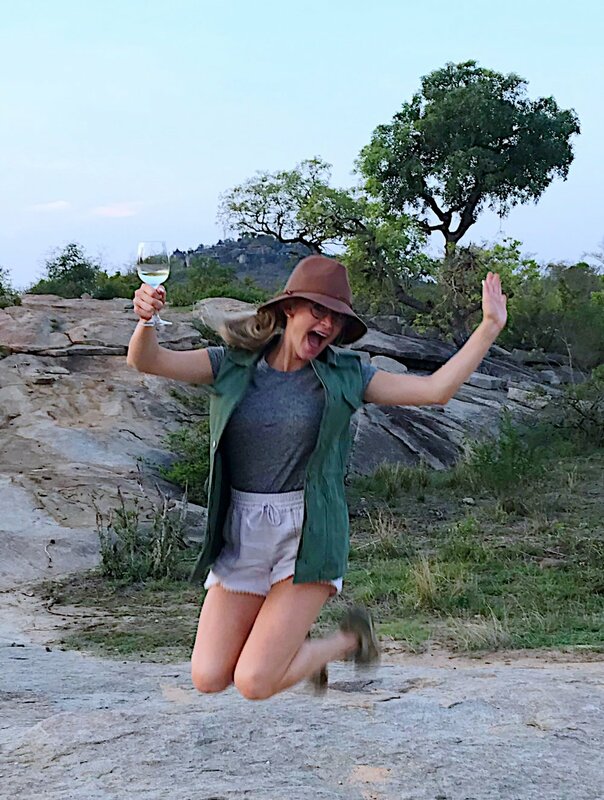 I would describe the attire for safari “personal preference.” It’s kind of whatever you want it to be, and everyone we met wore something completely different. We saw people in everything from workout clothes, to jeans and t-shirts, to traditional safari vests/hats, to shorts and flip flops, to maxi dresses and sandals. I say, pack whatever you’re most comfortable in! But two things are a must: 1) a jacket, 2) sunscreen and/or a hat. Tres and I went for comfort. We wore workout clothes the first day - LuLu lemon shorts, tee, jacket, and Nike tennis shoes for me. The other days, I wore more traditional khaki or comfy dress shorts with a tee or collared button down, a vest, and a hat. Pack a jacket no matter what!!! The mornings and evenings are fairly cool. We went in their summer season and the forecast was right at about 90 degrees, but most of the time it didn’t even feel like it. Sunscreen - yes!!! Cover your face. What I did not do was pack a ton of clothes. Our resort had daily laundry service, so you can re-wear clothes + you leave for your next destination with clean clothes - ahhh, fabulous! I’m sure it depends on where you live but if you’re on the east side of the country, the direct Delta flight from Atlanta to Jo’burg (16 - 17 hours) can’t be beat! I’ve heard of people flying over to Europe (on 8+ hour flights) then all the way down to South Africa (12 - 13 more hours) - that just makes me tired thinking about it. But look at your best options... it’s going to depend on where you live. Cape Town is an absolute must. I’ll have a guide for the food scene posted soon. I’ve also heard from multiple people Victoria Falls is fantastic if you have the time. 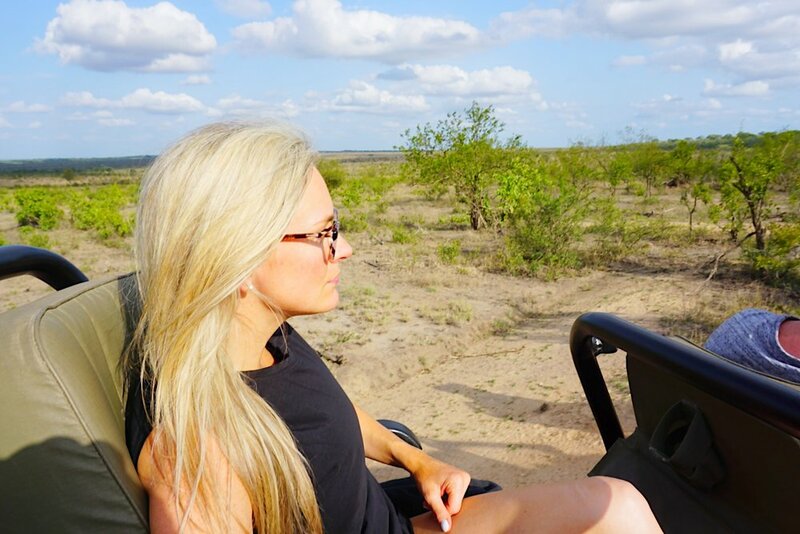 I want to go back and explore all of Kruger Park too... we heard you can just rent a car and drive through. I can’t imagine how neat that must be! *** Please email (andreascooktales@gmail.com) or Instagram me (@andreas_cooktales) with any questions you have that I may have missed. This is a big, important trip to plan, and I know as a first-timer I had a million questions. I hope I answered most of them but happy to help you directly if I didn’t. People who know Tres and I best, know we love wine. Heck, people who may not know much about us at all probably know that fact! Six sweet years ago, We took a trip to Napa and San Fran and got engaged. 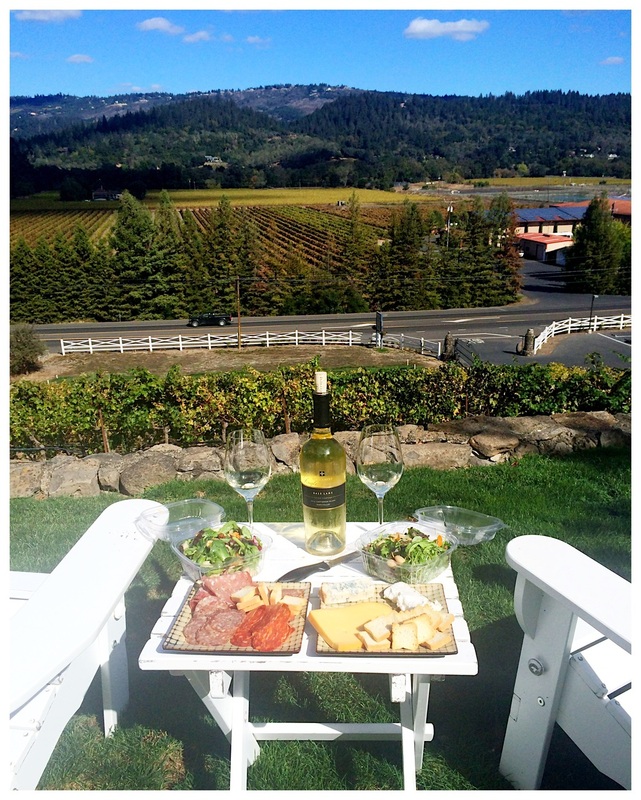 Ever since, Napa has been one of our favorite places on earth, and we tend to make at least one trip a year. California wine country is literally one of the most beautiful places on earth. I've always said, it's the closest landscape you can get to Europe in the US. Having traveled to wine areas in Germany, France, Italy, and Argentina, I can honestly say California wine country is still close to the top of our list. And it shows because we go A LOT! I call it my second home, and it really does feel that way. 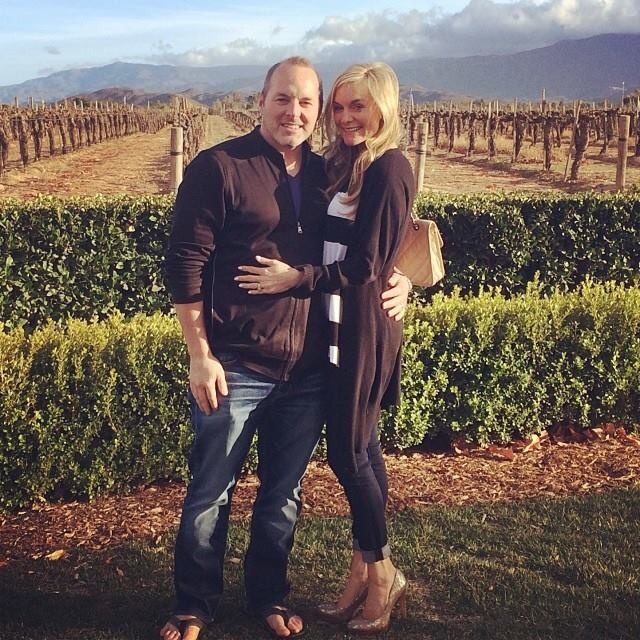 Some people like to go to the beach... we like to go to wine country! With that known, I get asked a lot for recommendations of our favorite wineries and restaurants. So, here's a list to go by if you ever decide to take a trip to the valley. The winery and views are stunning. The art and architecture is modern and welcoming. I'm a bigger fan of the atmosphere here than the actual wines. But go for the views and chic feel. A very knowledgeable tour with a fascinating family story and interesting vine picking and winemaking process. This wine is some of the best you'll ever drink... Rare to see it under $300 a bottle, but you get a glass on the tour. This wine is liquid gold, I tell you!Make an appointment. Best winery tour ever. Make sure you get the Full Circle Tour and go hungry! You will tour the grounds and learn about the produce they use in their food before you taste it. You'll get to eat fruit off the trees when walking around! I even took some of their bay leaves home - directly off the property! 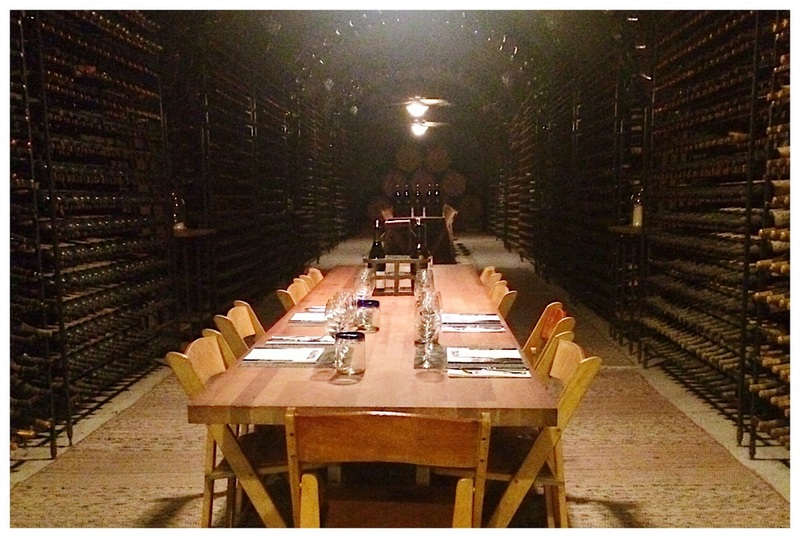 The tasting is in their caves, full of great food, superb wine, and elegance! We went at the end of the day so experienced a super fun staff. They drink the wine with you and are young and entergetic. Go at end of the day when it's kind of rowdy. This is a beautiful winery with good sparkling wine and a nice patio. There is also a nice restaurant to enjoy for lunch. I'm obsessed with this place because it looks like an absolute palace... It's incredibly beautiful. It's the first winery we ever visited and we keep going back. They are known for their delicious sparking wine. Order a tasting of all their wines and a small bite to eat (caviar, perhaps?!) and just sit on the patio and enjoy the views and richness of this place. This is one of mine and Tres' favorite wines ever. The atmosphere is low key, casual, and comfortable. You can genuinely see why it's called Frank "Family" because you feel like family here. Also a good place to end the day.. Lots of fun. Tres bought this wine for all his groomsmen in our wedding and we just keep on buying it! The Zin is our favorite. 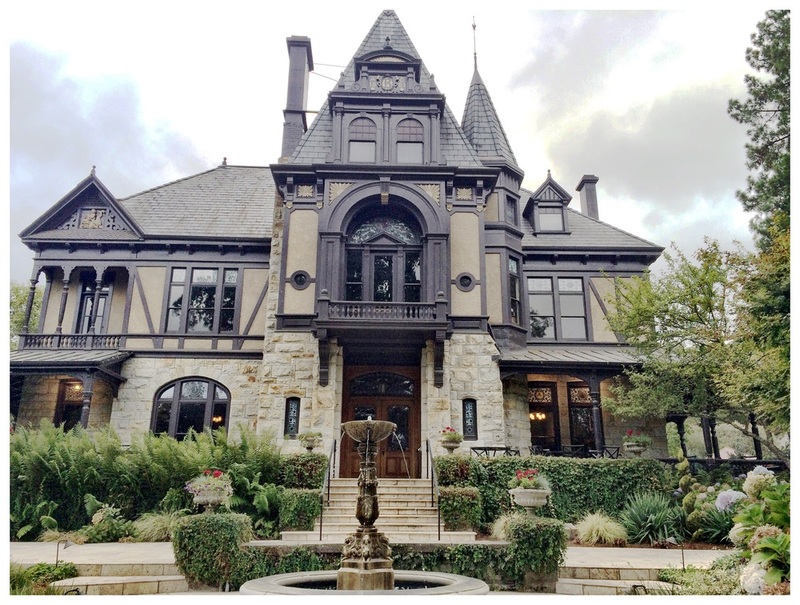 It's right across the road from Domaine Carneros and the views are absolutely gorgeous. I love the front door patio to sit, drink wine on, and just take in the absolute beauty of the landscape. 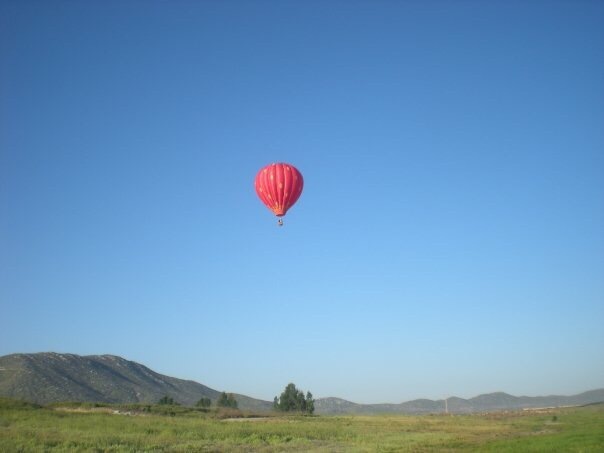 This one is in Sonoma. You feel like family when you walk in and the grounds are gorgeous to walk around and take in. The wines are good and not too expensive and the family story is an interesting one. Good wine, nice people. We have done a casual tasting and sit down tasting here. I like the wine better than the winery but worth going if you're on a mission to come home w good wine. Good wine, nice outside seating, and you'll more than likely meet one of the owners. It's right on the Silverado Trail so a great stop on a day you don't have appointments. The family here is so nice and personable... You get a real family feel. The grounds are pretty and it's nice to just sit and drink outside and enjoy the winery. Beautiful, busy, and right on the main highway. It's easy to get to and another good stop on a day you're winery hopping. Best patio ever and delicious sparkling wines. When you're here you feel like if you weren't here you'd be missing something. The crowd hanging here is fun, attractive, and just enjoying life. Right down the street from Mumm and Balducci, this is a must-stop. Delicious wines and views to die for! Ask to do a seated tasting, upstairs, on the patio. It's so relaxing! Amazing views and awesome tasting. You're literally on Spring Mountain here. They greet you with wine and you sit and enjoy the view. Tasting is outside which is great. You must make an appointment. Some of our favorite wines come from here, and we are wine club members of this one. Walk around and enjoy the grounds here, and you might run into a very nice man who will tell you lots of great stories and explain all the work that goes into the landscaping! This is my rec for if you want to picnic at a winery. You MUST pack a picnic and buy a bottle of wine here and sit in the front of this winery and just enjoy... It's amazing and beautimous! I also love the inside of the lovely victorian house! This winery was a pleasant surprise. I promise it's not wall to wall with white zinfandel. The wines here are quite good! The Victorian house on the main road is difficult not to miss, and when you go in for a tasting you'll feel like you've gone back in time. It's a stunning place and worth a stop! Really good wine and very popular. It's a crowded one but worth stopping at if you enjoy a solid bottle of wine. Taste them all and leave w one. Save it for a special occasion. Some of the best wine in the valley. Make an appointment for a great tour. I love how beautiful the grounds are here and the story of the family is so interesting. Our favorite wine here is Belle Glos Clark and Telephone! The mountain wineries are some of the best, and Pride has a lot to be proud of. 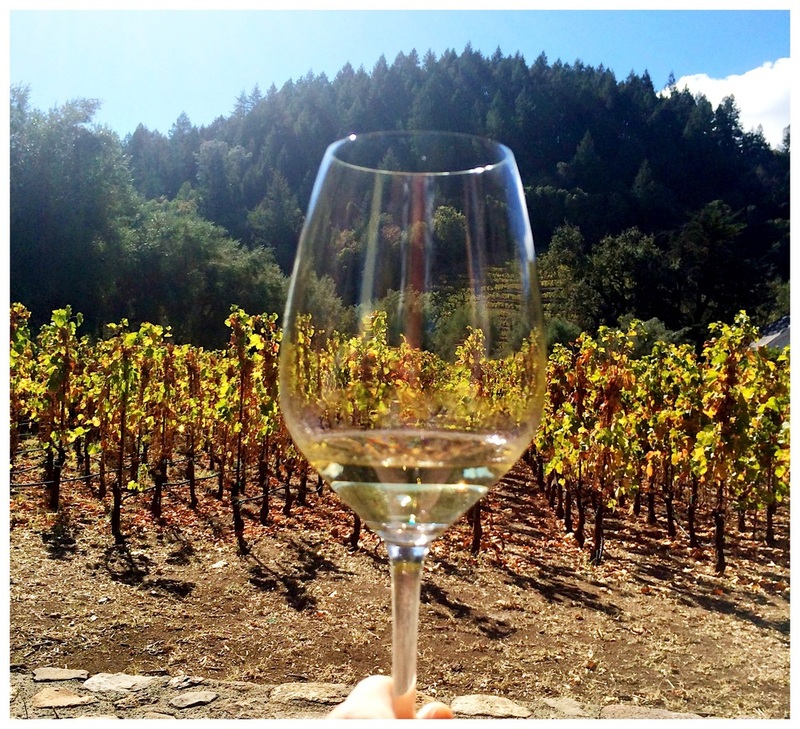 Their wines are delicious, their tour guides are great, and their views are some of the best. We took tons of pictures here! 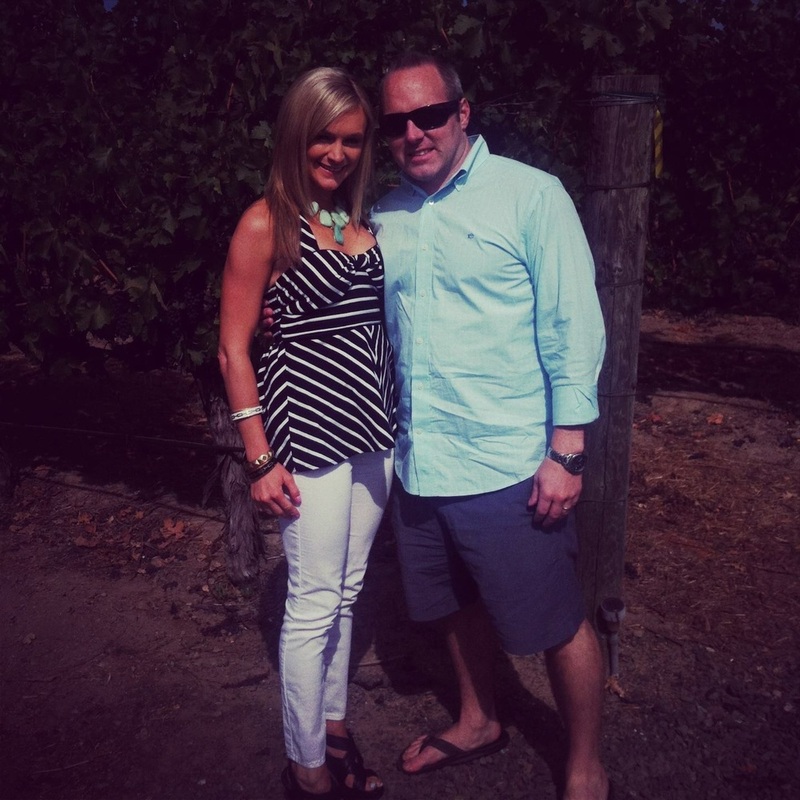 One of the best winery experiences we have ever had! Up a winding mountain, you'll think your lost on the journey up there, but once you get to the top it's like a spotlight is on Kuleto and all its glory! You'll feel like you were transmitted to an Italian vineyard. Farm animals run free, produce is abundant, and the panoramic views of the valley are that of what you can't get anywhere else. The wine is exceptional too. We took several bottles home a couple of years ago and haven't touched them yet. Hands down #1 food rec I have for Napa. Best brunch ever. Of all time. 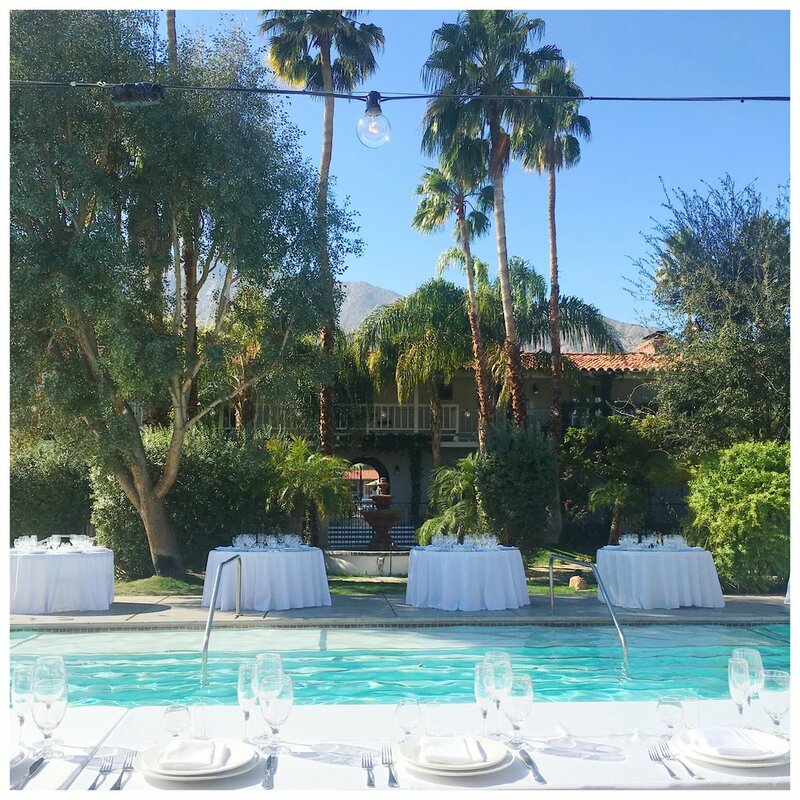 It's a multi-coursed brunch with some of the most delicious food you can imagine and the best views of the valley from your patio table. Rusic, casual, fun, farm to table restaurant. It's right on the main highway, and a great lunch stop if you've been drinking wine all day and get hungry. The food here is some of my favorite! We have done dinner here, too, and would do it again! Best dinner in Napa. I love their menu selection and their food is just down-right fabulous! Book well in advance. A Thomas Keller must! What am I saying... All Thomas Keller restaurants are a must! But this place is legendary when it comes to fried chicken night! Make sure you book on the right night. It's everything it's hyped up to be... Promise! Another Thomas Keller favorite - we never go to Napa without a stop here for lunch. We sit on the patio, drink champagne, and eat as many oysters as we can stand! A great brunch stop with a cool atmosphere, fun menu, and ambiance that could keep you there all day! If you're a food person at all, this is just a must. Even if you just walk around, but you won't want to do that. It's difficult to go in and not buy everything you see. We always get our picnic spread here and take it to a winery to consume with a bottle of wine! Clif Family is a must! It's a winery complete with bike rentals and a Bruschetta truck! It's a great lunch stop, and if you go at the right time, you can do a Bruschetta Wine Tasting. Their delicious wines are paired with bruschettas from their food truck.. Yum! If you stay in or close to St Helena, this is the perfect pre-wine tasting stop. 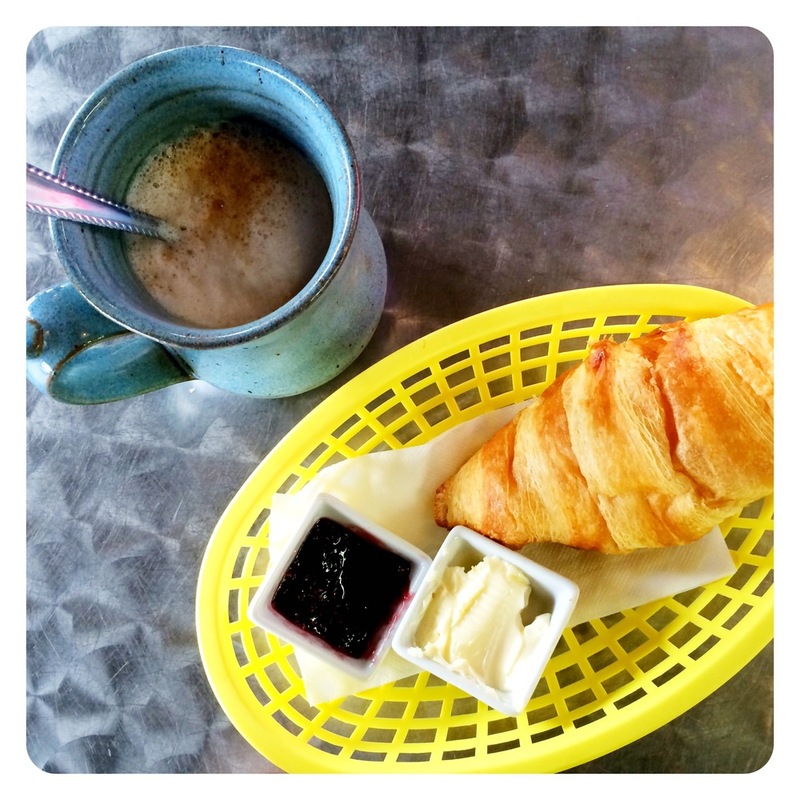 Delicious coffee and pastries, and the best homemade English Muffins you'll ever eat in your life live here! Amazing amazing amazing Italian food and pizza! I can't even with this place! 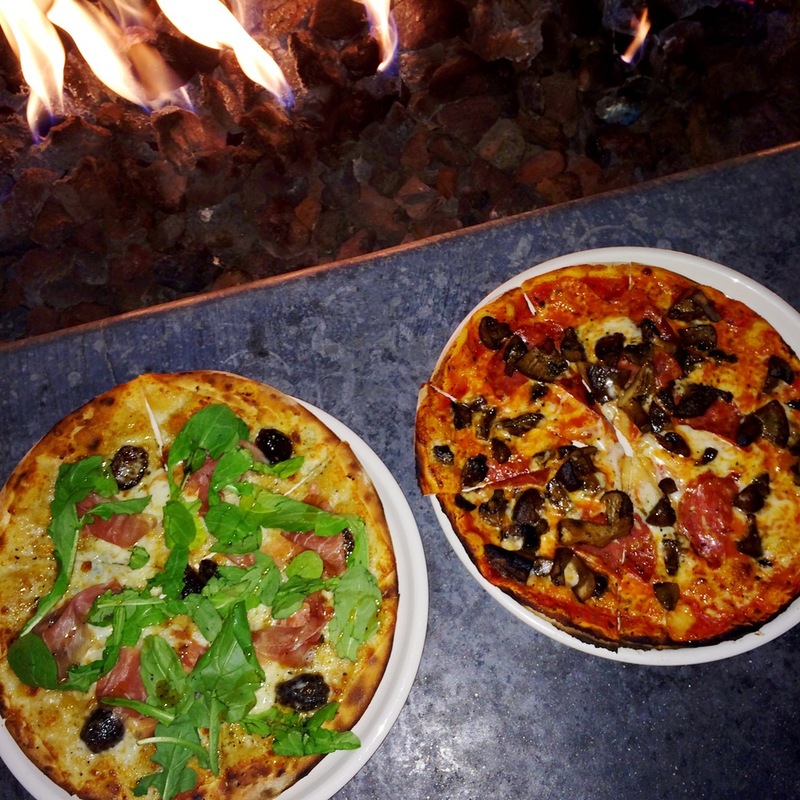 Sit on their lovely patio for dinner and have one of their pizzas and the Rabbit Ragu! A great, low-key, casual dinner spot. Don't let the casual throw you off - the food is to die for! An upscale pub with great food and the best cocktails in the valley! 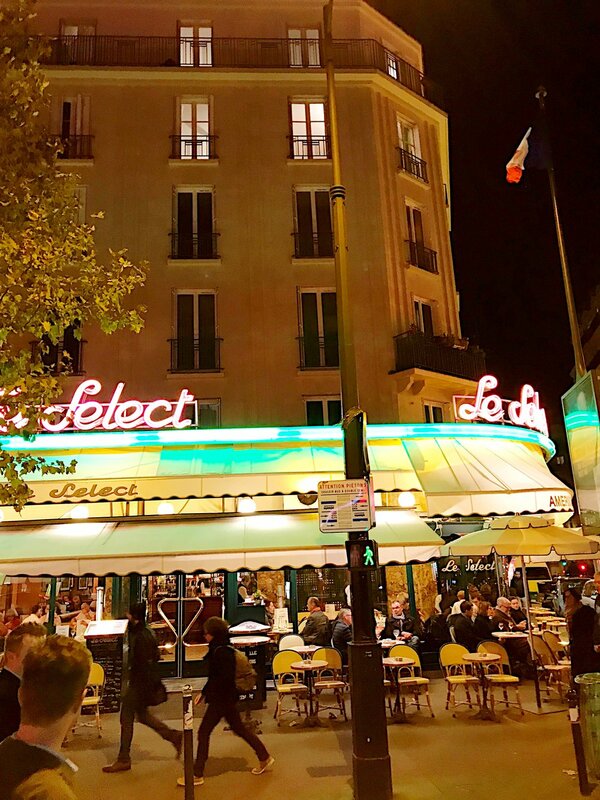 If you can stand to drink more, go here after dinner for a nightcap. Or have dinner here - it will knock your socks off! A delicious Italian restaurant with a menu you will love and an atmosphere you want to be immersed in. Their cocktails are great too. It's fun to try a little bit of everything off the interesting menu. i love this place because it's like being in France! You get the best of both worlds... Ideal French cuisine in the middle of Napa Valley. 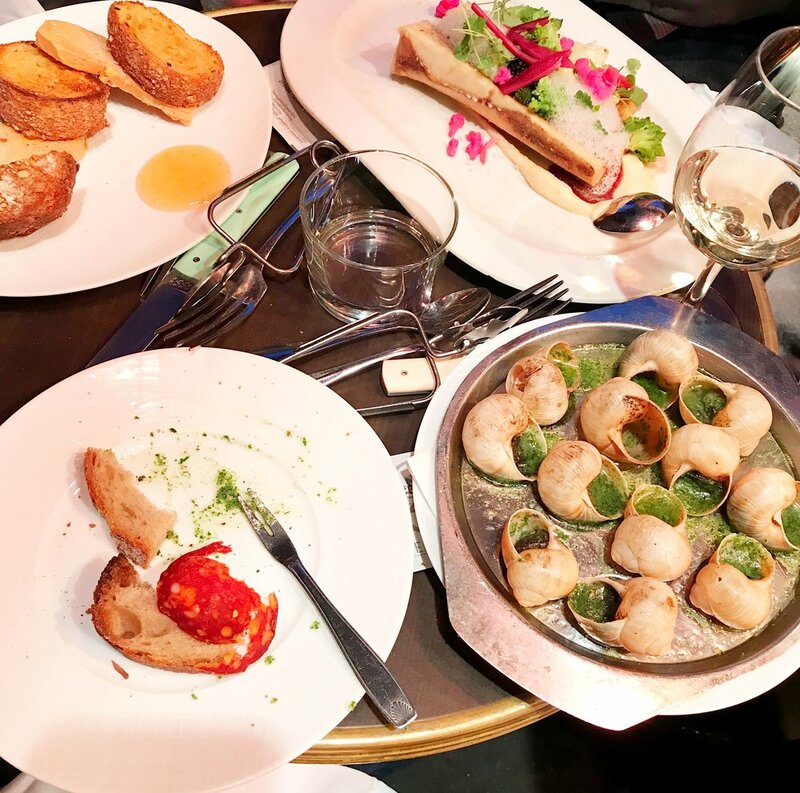 From foie gras, to pate, to escargot, to onion soup, this place screams French food and does it just right. The food here is superb but once you sit on the lush patio, you'll realize everyone really comes here for the sophistication. The ambiance at night cannot be beat... It's so chic! If you're staying in or around Santa Rosa, you don't want to miss coming here for a beer or two. We did the beer sampler and I would go back 100 more times! Sure, you're in wine country, but you may want to take a break for a cold one. 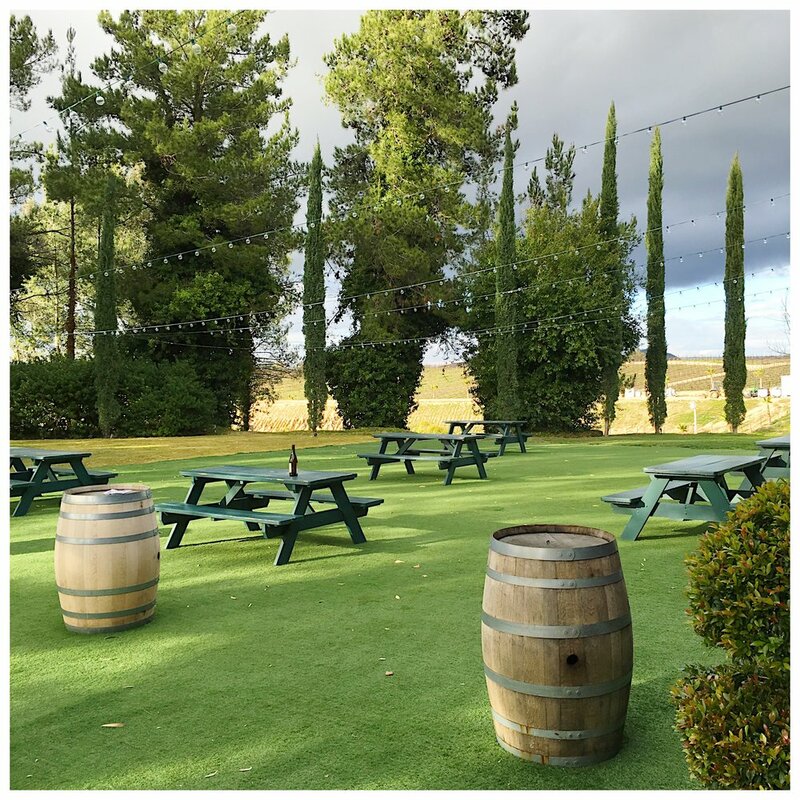 Willi's is off the beaten path from the main area of wine country but if you're staying near Santa Rosa, this restaurant needs to go on your list. I couldn't even decide what to order here there was so much that looked good! You leave very full and happy. This place is in Sonoma and it's my favorite restaurant there! I have the cookbook and love it - if that tells you anything. *** I'm always adding to this list, as we continue to go back to Napa every year! We will be there in October so I'm sure there will be an update by the end of the year! Tres and I are headed to Vegas next week for the Guns N Roses concert. Yes, you heard me right, Guns N Roses!!!! If y'all haven't heard, the never ending feud between Axl Rose and Slash has been patched up, and the band has reunited after over 20 years. The kickoff: Vegas! Ok, first off, we don't miss a Jose Andres restaurant - ever. If we visit a city and he has restaurants there, we make an immediate reservation to all of them. He's a genius and probably our favorite chef of all time. You don't want to miss this restaurant. Walking in alone will make any meat eater love life just a little bit more. Meats you've never thought of before - strung and hung every which way, you feel like you're walking into the best butcher shop on earth and then it just gets better. The menu is playful and the food is all one big presentation. We had Cotton Candy Foie Gras, a chicken dish that came out in a glass sneaker, and smoked oysters that were actually smoking when brought to the table. You don't forget a meal like this one. Giada's restaurant represents everything she is as a chef. The focus is delicious Italian food with a California twist, a menu full of fresh, clean, light options with divine flatbreads, pastas, and main entrees. 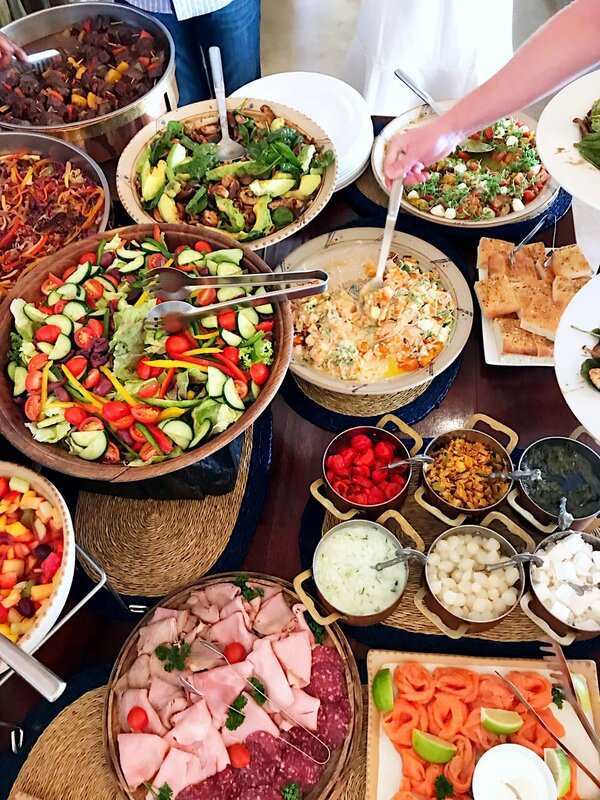 And I cannot forget to mention my favorite thing about the restaurant (which is also my favorite thing about Giada): "a little bit of everything and not a lot of anything." Her menu features a lot of small bites so you can try many different items, and you'll want to - it's difficult to make your mind up. My favorite is the Imported Buratta. That may sound boring, but I've had a lot of Buratta in my time and the one there is the best! Go during the day, sit by the windows, and enjoy life. The views here are the best and most enjoyed with a bottle of champs or sparkling wine. For crying out loud, go here just to get the famous Spaghetti. At first glance of it on the menu, you won't know better and you'll look right over it. But I'll make you a promise: you'll never eat a tomato basil sauce like this ever again. EVER. It's simply the best. In addition, the full pasta menu here is to-die. I also suggest the Duck Foie gras Ravioli. A Mario Batali/Joe Bastianich creation, this tucked away, cozy spot is perfect for dinner. A very authentic Italian experience, you'll find this restaurant in the Venetian, and you'll also find their Grilled Octopus to be one of the best you've ever had. As far as pasta goes, get the Black Spaghetti and the Wild Boar Ragu. All I can say about this place is: GO HERE! Do not miss it. A very casual and inexpensive restaurant, it's a perfect lunch stop if you're walking around the shops at the Venetian. Getting pizza or pasta is a difficult decision, so get them both. They also bring out the most fabulous bread. You probably won't eat the rest of the day, but it's so worth it. You didn't think I was only going to mention one Jose Andres restaurant, did you? This menu is the way I see Jose Andres as a chef - modern, whimsical, authentic tapas. This is another restaurant I love so much because the small portion sizes allow you to try so many different menu items. And you'll want to because the menu is a mile long, yet everything is unique and oh so good! We have been here so many times and ordered so many different dishes! This is the type of restaurant where you ask your server to just order for you, and you'll be more than happy. 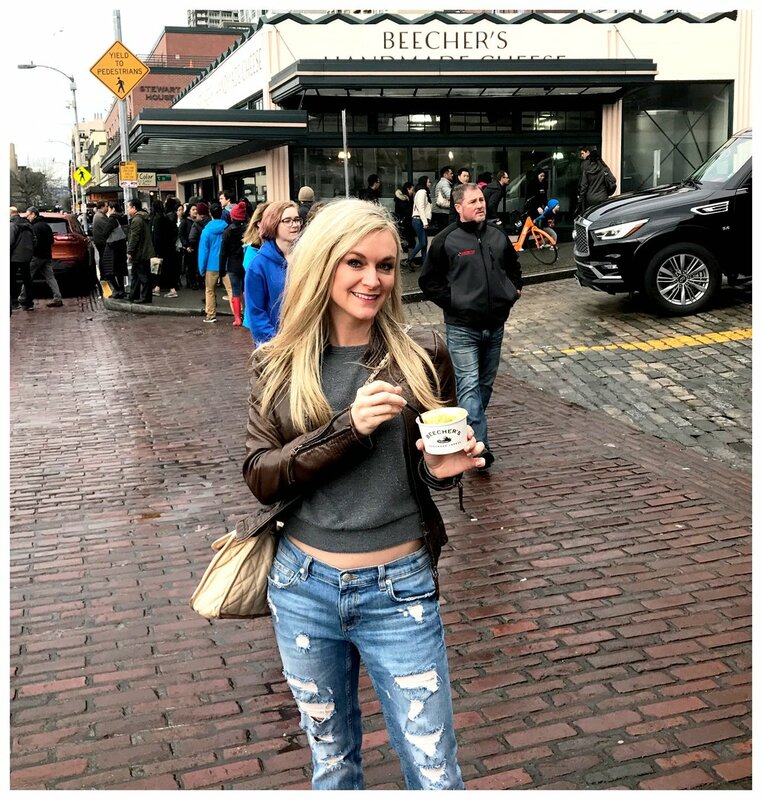 When we go to Napa, we make a stop at Bouchon. And when we go to Vegas, we make a stop at Bouchon. A Thomas Keller work of art, this restaurant is well-known for it's bakery so it's a great breakfast or brunch spot. I like it for brunch because they always have the best oyster selection as well as a delicious champagne and cocktail selection. The bakery and the restaurant are different so don't get them mixed up. I suggest the restaurant because you can still enjoy the bakery treats along with a great meal or take some to go! We first went here when we were in NYC and to my happy surprise, they opened one in Vegas! This place is beautiful with the most fun atmosphere and the food is delicious. Oh, and the cocktails are to die for... I love the one with Pink Peppercorn syrup. 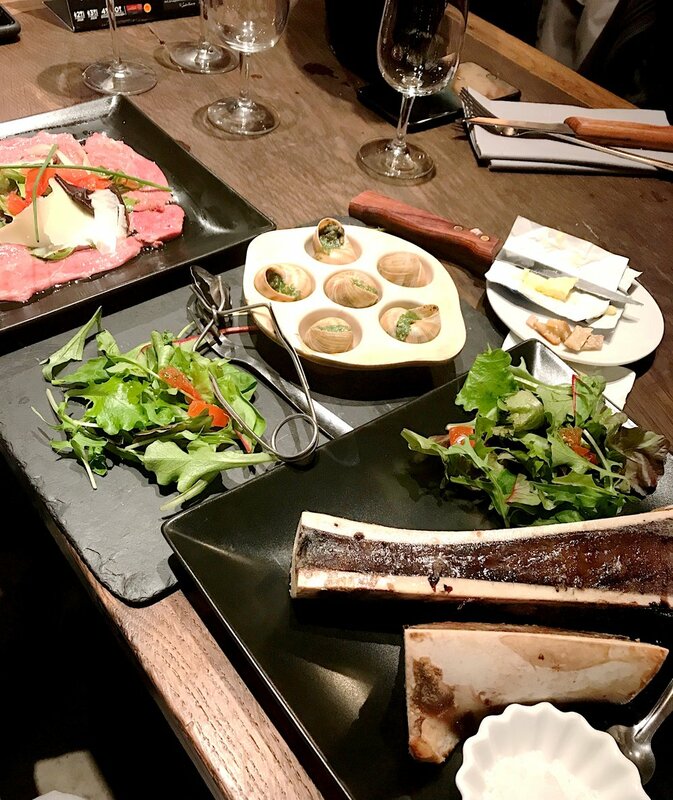 A phenomenal modern steakhouse with delicious sides and great starters. The best part about STK is the atmosphere, complete with loud music and an attractive wait staff. It's like being in a calm version of a Vegas club, yet you're surrounded by great food. I suggest going here with a large group of friends... you'll have a blast. Absolute delicious dim sum, soups, and noodles!!! Love love love this place when in the mood for thai food!! It's in the Aria hotel. Have you ever seen a wine angel? 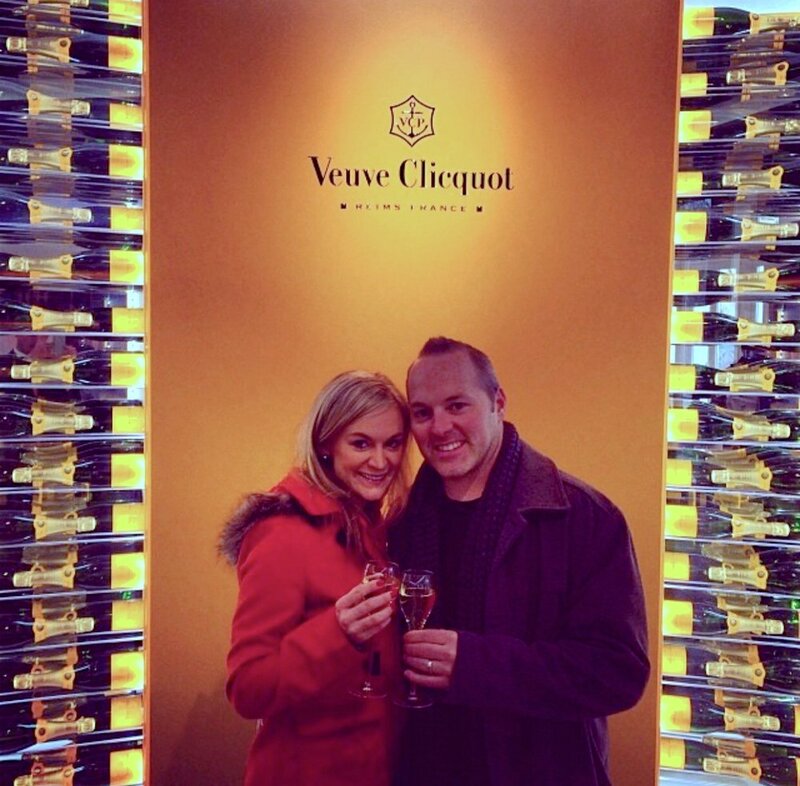 If you go to Aureole, you will! If you're a big fan of a lengthy and spot-on wine selection, this is your place! If anything, just go to see those angels grab the bottle of wine you choose from the glass four-story wine tower. The women, known as wine angels, are hoisted into the air where they sometimes perform acrobats and come down with your bottle of wine. If that isn't bravo, I don't know what is! CHEERS TO HAPPY EATING IN VEGAS!!! BEST. PIZZA. IN. CHICAGO. I literally dream about this pizza all year until we visit again. I've had pizza at Gino's and Lou's and love them both but this tops the Chicago pizza scene! The same thick crust you love about Chicago pizza, but what they're really known for is their caramelized crust... There's just nothing like this pizza anywhere! Go here and thank me! I love this place for dinner. It's one of the first restaurants I ever went to in Chicago when I decided Chicago was my favorite food city. Its a tiny little "shoebox" of a place - literally you could throw a rock from one end to the other but the food will make you scrunch in and enjoy it every time! Small and large plates with very interesting selections! It's communal seating so hope you like meeting strangers... We do! If you're a food person, you've heard the hype of this restaurant, and its all true! Call ahead and TRY to get a seat. Good luck though.. It can be tough! We went at the end of the night and literally waited until almost the end of the night just to eat here, but oh my goodness, is it worth it!! I highly recommend letting your waiter order for you... The food is so innovative and everything is wonderful! The Terrace gives you the most amazing city views you'll ever see! Forget the the tourist building rooftops, this is the one to go to... Plus cocktails added to the mix is a huge bonus! Step inside and have a fancy dinner at Sixteen. Beautiful views, a grand tasting menu, and all-out elite service. This restaurant is a splurge but great if you're a foodie! Favorite rooftop bar ever! Beautiful city and water views and fun cocktails... If I had a top 5 Chicago list, this one would go on it! We go here every time we visit the city! An upscale, lovely rooftop bar with a fabulous crowd, great little bites to eat, and fun drinks! If you go to a Cubs game, a concert at Wrigley, or are just in the area, you have to stop here! Great patio with a vast beer selection... I love the taste tester. Also get the Paulina Brat if you're hungry... Yum! Favorite brunch place by far in Chicago, but great for dinner too! The menu is fantastic and I love this place so much I follow them on Instagram just to always be updated on all their deliciousness! They focus on seafood (omg oyster selection) and pork (omg slab of bacon) with a large selection of international beers. It's ALLLL about the experience here! Extremely unique cocktail menu with some of the most creative cocktails you will ever see or experience. Yes, I keep saying experience because it's all about the presentation here! Very happening spot for locals and tourists alike. Try to get reservations or you will wait in line for hours. Such amazing beers in a homey, local feeling tasting room. Highly recommended for beer lovers. Sit on the patio for lunch and do a meat and cheese plate with champagne or wine. An interesting menu where it's difficult to pick what you want-- try as much as you can! We rarely repeat restaurants but this is one we will! I have my morning coffee and pastry here at the Lavazza cafe every morning I'm in Chicago, but there's so much more to it than that!! It's a specialty food store and market downstairs, and upstairs is an array of modern Italian eateries and a wine and beer selection that will blow your mind! Taste the wine, try the beer, eat the food, shop for goodies --- you could stay in here all day! I cannot say enough about this place... Their food, cocktails, and everything they do is the love of my life next to Tres! My Truffle Sliders recipe was a recreation of a small plate at this place because their sliders were literally one of the best things I've eaten in my life! We first heard of Sable from a local guy who insisted we go there for cocktails, and while their drinks were spot on, I cannot say enough great things about the food! Small plates with a flair... Some of the best little bites of food ever! We went here 3 times last year and plan to go back! Amazing dinner in a vintage atmosphere! The place used to be an old bath house and now it's a perfected restaurant with an outstanding menu and on-point cocktail selection. 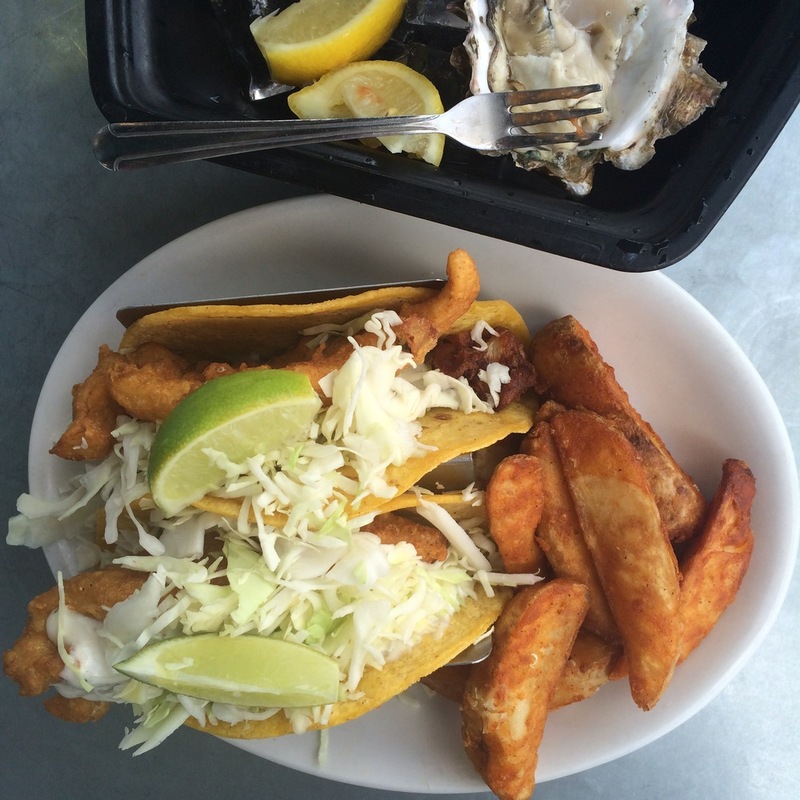 This is the seafood place to go in Chicago! Delicious, fresh selection. Their Caviar service is amazing! Great brunch with a fantastic little patio! It's kind of far away from the city center but you can take a cab and it's not too bad! If you're a bruncher, next to The Publican this is the spot! It's so touristy but just do it. Please do it... At least once. You won't be sorry. I can't even put into words how much I love these sandwiches. I have a lot of good things to say about this little "off the beaten path, hole in the wall." If you like just a random, local dive bar where you can belly up and drink beer, this place is pretty solid. Tres and I found it by accident after getting caught in the rain, and we ended up staying for hours and drinking, and drinking, and drinking more. The atmosphere is cozy and they have a Juke box with a strong music selection which always makes for a fun time! Great Italian food and atmosphere. Good date night spot. Good brunch spot. It's fun with a group of gals because you can do all kinds of different wine flights, and they even have a mimosa flight! Extremely long, awesome beer list. We followed a local here... Perfect place for a beer lover. And all I have to say is, just come here for the pork fries. Just do it. In January I meet a great group of people that the rest of America will get to meet tomorrow night: the chefs of MasterChef Season 6. Tomorrow night reveals the top 40 home cooks in America, and I'm proud to say I was a part of the Top 100 (out of over 40,000 who auditioned) of this group, all starting with an audition in October that made the holiday season of 2014 an interesting one for me. From October-January, it was audition-city for me -- and it was all a big secret. No one really knew what all was going on in my life for about three months, and to tell the truth, neither did I. Everything was a mystery until January. I never in a million years thought I would audition for a cooking reality show, but when MasterChef came to Memphis and friends and family urged me to "just show up and see what happens," I found myself standing in a hotel ballroom full of MasterChef hopefuls with my Le Creuset dutch oven full of Brown Sugar Braised Short Ribs and my saucepan of Mascarpone Grits sitting in front of me - my signature dish - ready to be plated together and judged. Then a funny thing happened. I was advanced to the next round, and then to the next, and then to the next. Before I knew it, I had been through several in-person interviews, an on-camera interview, a home video, and lots of back and forth emails - just to name the half of it. Every time I got a callback to advance further, the question, "am I REALLY going to make it to the next round?" continued through my mind. To my surprise, the answer was YES each time, and next thing I knew I was invited to LA and given the title, along with 99 others, "Top 100 Home Cooks in America." I couldn't pass the opportunity up, so of course I went. From the beginning of December until I got to LA in January, my life was a whirlwind of preparation. I couldn't show up with the other 99 "best home cooks" without a plan and lots of practice. I cooked dishes I had never thought of cooking, and baked, and baked, and baked. Christmas was an afterthought for me in 2014; although, a lot of good cakes and pies came out of the whole deal, so our holiday spread was definitely unbeatable! And then it was time to go to LA. I knew nothing of what was to happen. All I knew was I couldn't tell a soul (aside from family) the reason I may or may not be in contact for the next several months. I was walking into it completely blind, and I was totally ok with that - anything to take my cooking career to the next level. 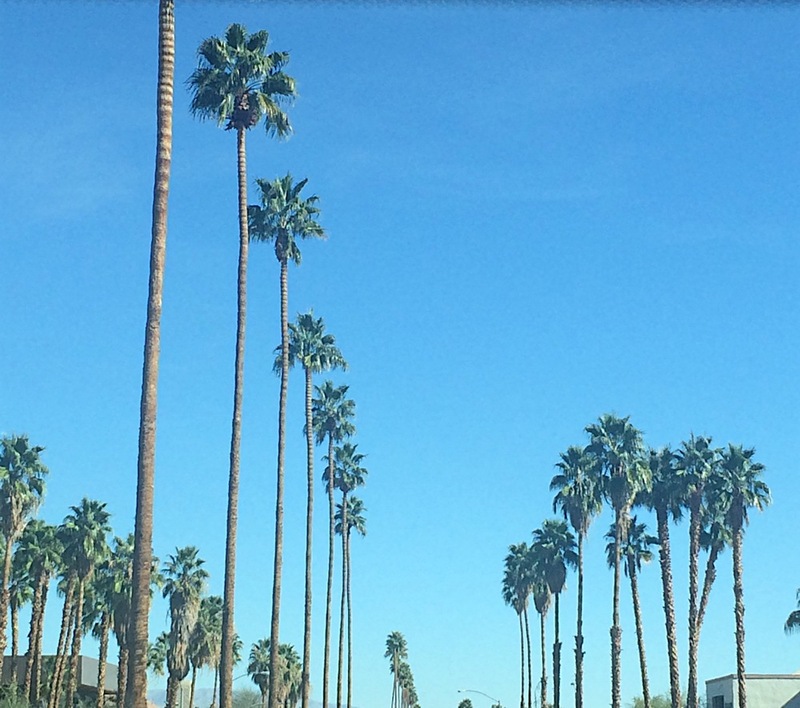 I was in LA for almost a week - more interviews, audition meetings, wardrobe decisions, etc. (I don't want to tell too much), but hands down, my favorite part of the week was not the process, but the people I met through it. What I found to be so fascinating and uplifting was that 100 people who were totally different from each other had so much in common, and it all dealt with the one thing we all love the very most - FOOD! I not only met the best home cooks in America, but 99 of the most interesting, fun, passionate people I've ever come across. The MasterChef experience was hands down one of the coolest, craziest, most bizarre, and most awesome experiences in my life. And some pretty cool friendships and food networking came out of it, too. So, if you haven't figured it out yet, I didn't make the show. But you know what? I didn't need to. I know I have a future in cooking, but it's just not there. Luckily, 40 other awesome humans DID make the show, and America gets to meet them tomorrow night! Watch MasterChef Season 6 on FOX, Wednesday, May 20. This season is sure to be the best yet because it features the coolest cooks I know! Don't miss it! !